Mary Queen of Scots (K.K. 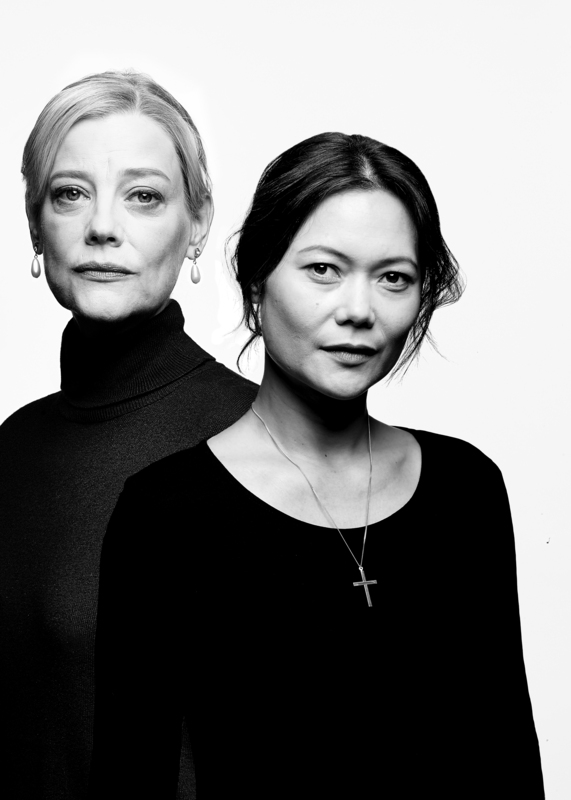 Moggie, at right) comes face to face with her cousin and captor Queen Elizabeth I (Kellie Overbey) to plead for her freedom in Chicago Shakespeare Theater’s production of Schiller’s Mary Stuart, in a new version by Peter Oswald, directed by Jenn Thompson, in CST’s Courtyard Theater, February 21 – April 15, 2018. Photo by Liz Lauren. Mary Stuart (K.K. 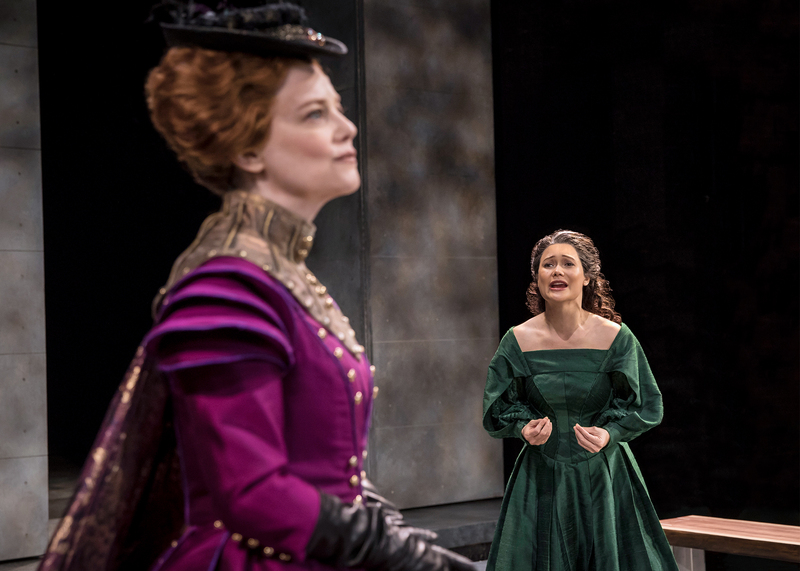 Moggie) implores her cousin Queen Elizabeth I (Kellie Overbey) to release her from her imprisonment in Chicago Shakespeare Theater’s production of Schiller’s Mary Stuart, in a new version by Peter Oswald, directed by Jenn Thompson, in CST’s Courtyard Theater, February 21 – April 15, 2018. Photo by Michael Brosilow. 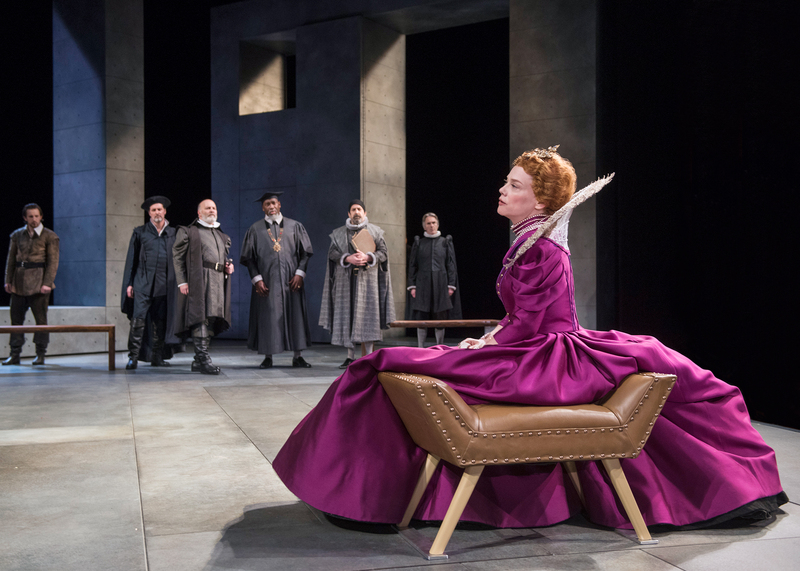 Queen Elizabeth I (Kellie Overbey) contemplates her next move, as a cadre of lords and advisors jockey for power (from left to right: Andrew Chown, Tim Decker, Kevin Gudahl, Robert Jason Jackson, David Studwell, and Michael Joseph Mitchell) in Chicago Shakespeare Theater’s production of Schiller’s Mary Stuart, in a new version by Peter Oswald, directed by Jenn Thompson, in CST’s Courtyard Theater, February 21 – April 15, 2018. Photo by Michael Brosilow. 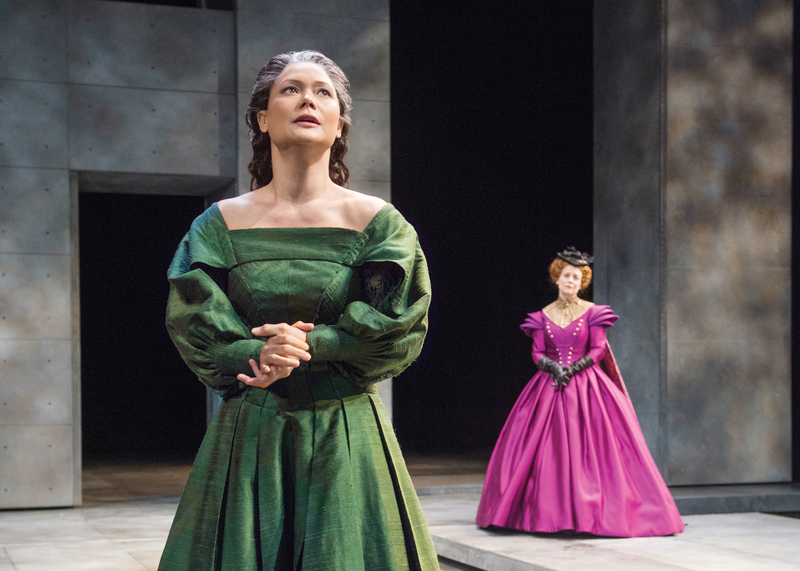 Queen Elizabeth I (Kellie Overbey) faces an uncertain future, as Mary Stuart (K.K. 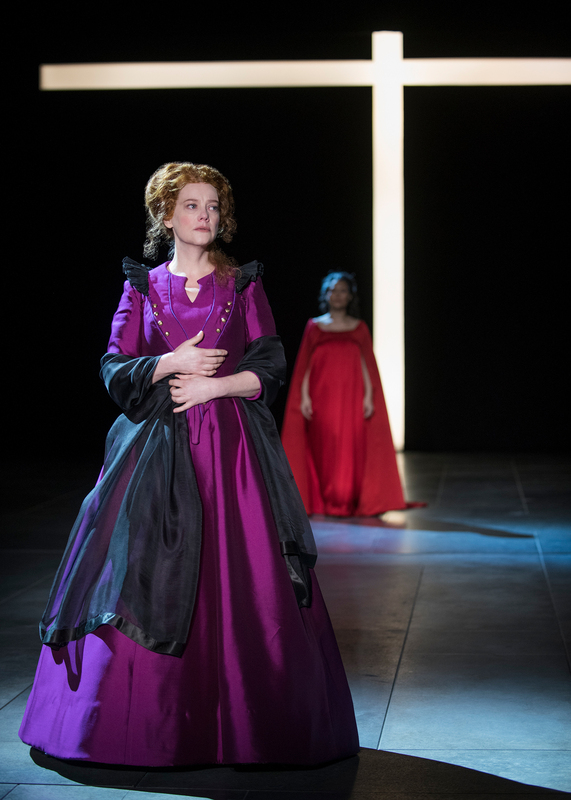 Moggie) looms in the distance in Chicago Shakespeare Theater’s production of Schiller’s Mary Stuart, in a new version by Peter Oswald, directed by Jenn Thompson, in CST’s Courtyard Theater, February 21 – April 15, 2018. Photo by Michael Brosilow. Paulet (Kevin Gudahl) and Mortimer (Andrew Chown) oversee Mary Stuart’s (K.K. 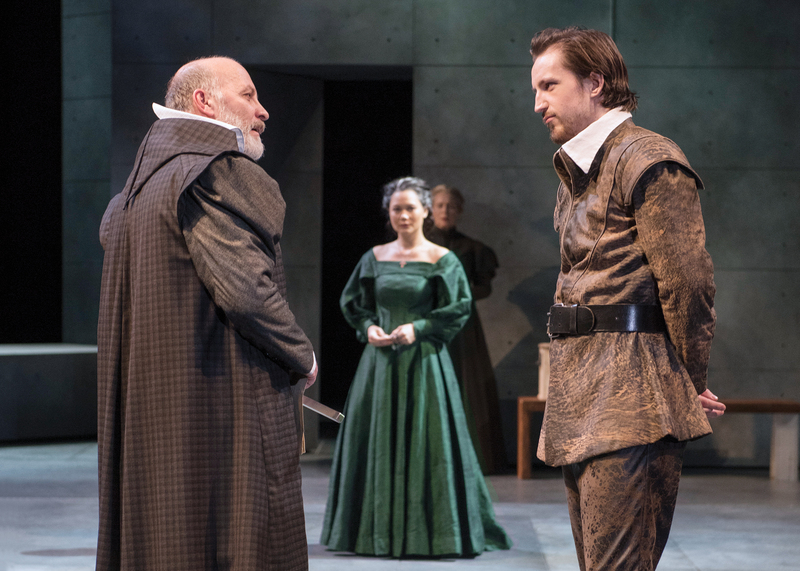 Moggie) fate in Chicago Shakespeare Theater’s production of Schiller’s Mary Stuart, in a new version by Peter Oswald, directed by Jenn Thompson, in CST’s Courtyard Theater, February 21 – April 15, 2018. Photo by Michael Brosilow. Kellie Overbey is Queen Elizabeth I and K.K. Moggie is Mary Stuart in Schiller’s Mary Stuart, in a new version by Peter Oswald, directed by Jenn Thompson in Chicago Shakespeare’s Courtyard Theater, February 21–April 15, 2018. Photo by Jeff Sciortino.